Can I ride it in the rain and can it be washed? Due to its waterproof wiring harness and Direct Current source, there is no danger when the scooter gets wet. When cleaning, care should be taken not to pour water directly into the charger inlet, the controller and the internal battery set. Can the scooter be ridden at night time? Yes. The scooter has been designed to be ridden at night time with comparable lights to any other vehicle. The battery capacity is such that the lights don't have much effect in reducing the scooters range. Can two people ride on the scooter? Yes. The scooter has been designed to carry two people with enough power and a suspension system which is both soft and designed to take weight. Besides the weight of the scooter, it can carry another 160kgs. In two words, easy and fun! With its low centre of gravity, responsive controls, conventional twist grip throttle and brake levers the scooter is easy for anyone to ride. It is also whisper quiet so you can have the power without the noise. Do you have to warm the scooter up before riding it? No. When you turn on the ignition key, three beeps will immediately follow telling the rider the scooter is ready to ride. It couldn't be any easier. Do I need a motor bike license or can I ride it on a car license? 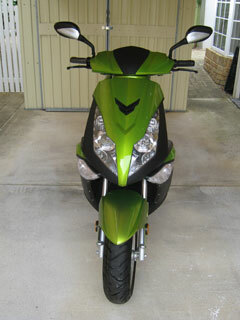 You will need an R-E (up to a 250cc) motor bike license unless it is classed as a Moped (below 60km/hr)(R-N). This electric scooter is designed for minimum maintenance. With no combustion engine, lubricants, fuel, belts or drive trains it's virtually maintenance free. Just plug it in at the end of the day and unplug it at the start of the next day. The owner can keep an eye on most things and any scooter dealer can service the mechanical side. Depending on the users operations (long or short runs) between 2000 (80% SOD) and 3000 (50% SOD), even longer for short runs or combinations of runs. Please note the batteries life cycle will be reduced or damaged if insufficient charge level is a retained for a long period. Is it easy to recharge the batteries? Yes, it is very easy. Just plug one end of the charger to the inlet on the scooter and the other end into any 3 point plug. Two red lights will appear and one green light when the battery is fully charged. When the battery is fully discharged it will take between 4-6 hours to recharged, much less when the battery has been only partly discharged. This is with the scooters standard 10 amp charger. A 50 amp charger can be purchased for much quicker charging. The charger can be left on all night (or day) or can be switched off during a charge so the scooter can be used for further distance. It is advisable to recharge the batteries even after a short run if the scooter is not being used again for a while. How do I know the batteries condition and energy level? The scooters instrument panel includes a battery indicator which clearly shows the power level, giving riders an indication of how much further they can ride. See the scooters specifications or contact us.